Holmes Coal Pulverizers are bench-type units that perform well in reducing coal or coke from No. 4 to No. 60 sieve size. 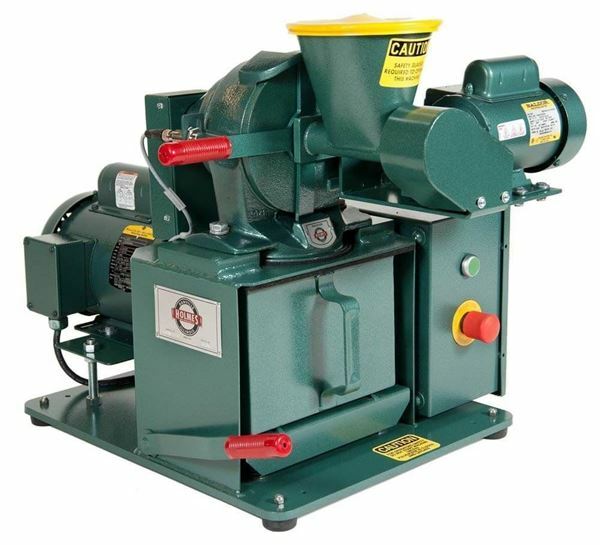 Models are available with manual or auger feed. All units are constructed of painted steel and cast iron, and have one-piece balanced rotor with hard coated hammers, driven by 1hp, single phase motor with overload protection. Chambers are fully sealed with a quick-opening latch with safety interlock for cleaning or changing screen plates. Feed hoppers and sample cups are galvanized. Standard feed hoppers have 0.5L capacity and vinyl snap-on cover. Inquire for 1L hoppers. Each model has a lightweight steel base plate mounted on four rubber pads. A sensor stops power when the chamber door is open, and resumes when it is closed and latched. Five screen plates are supplied with each machine – select from six available perforation diameters: 0.020, 0.024, 0.033, 0.040, 0.0625 and 0.093in (0.508, 0.610, 0.838, 1.02, 1.59 and 2.36mm). Lock pins secure screen plates in pulverizing chamber. Each model also comes with approximately 10ft of power cord (but no plug) for connecting to a power source. 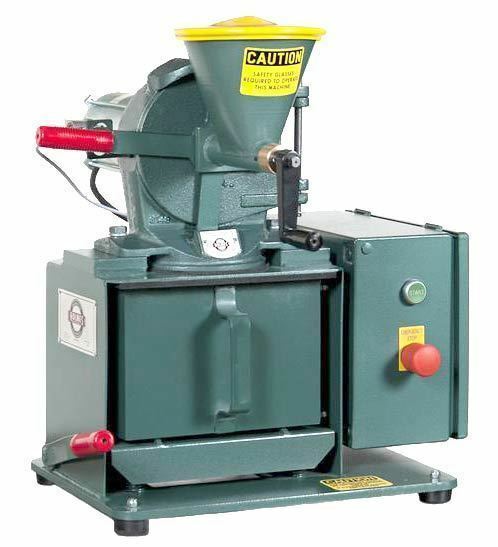 LC-350 manual feed pulverizer is equipped with manual feed from the hopper to pulverizing chamber. Approximate processing rate is 0.9lb/min (400g/min) with 0.024in screen plate. LC-500 model has a 1/8hp chain-driven auger feed, and approximate processing rate of 0.9lb/min (400g/min) with 0.024in screen plate. LC-502 unit is also equipped with 1/8hp chain-driven auger feed and includes a 325-cubic inch sample container. Its approximate processing rate is 1lb/min (450g/min) with 0.024in screen plate. Inquire for 115V/60Hz.